Out with the old; in with the new. Not too long ago, the process of creating an Options page for a WordPress theme was a bit of a nightmare. Sure, it was relatively easy to do once you’d wrapped your head around the process, but, it required an extensive amount of work, including writing security checks, creating the forms, manually adding hidden inputs, and so on. Luckily, as of WordPress 2.7, the process has been streamlined, thanks to the new Settings API. In this tutorial, Jeffrey Way, author of Build Your Own Wicked WordPress Themes demonstrates exactly how to build an Options page from scratch. He also included a video version of this tutorial for those who prefer a more visual approach. You’ve no doubt seen a number of these sorts of articles around the web, but this will make the process as understandable as possible—particularly for those of you who are just getting started! Let’s begin. First up, let’s organize our thoughts a bit, and determine exactly what we want our final product to look like and do. This Options page should allow us to upload images, add text, and perhaps choose color schemes. Figure 1, “The finished Options page” shows what we’d like our Options page to look like by the time we’re done. In accordance with the value entered in Figure 1, “The finished Options page”, this will render “Buy Me.” Pretty convenient, right? Okay, let’s build this thing. We have two alternatives when it comes to creating the Options page. We can either treat it as a plugin, and store it in the plugins folder, or we can make it a theme-specific Options page, and store it within our theme’s functions.php file (or another file included from functions.php). In this case, we’ll go with the latter solution, though either approach will work. As TEMPLATEPATH will automatically generate the path to your theme folder, we need only continue the path to admin-menu.php. 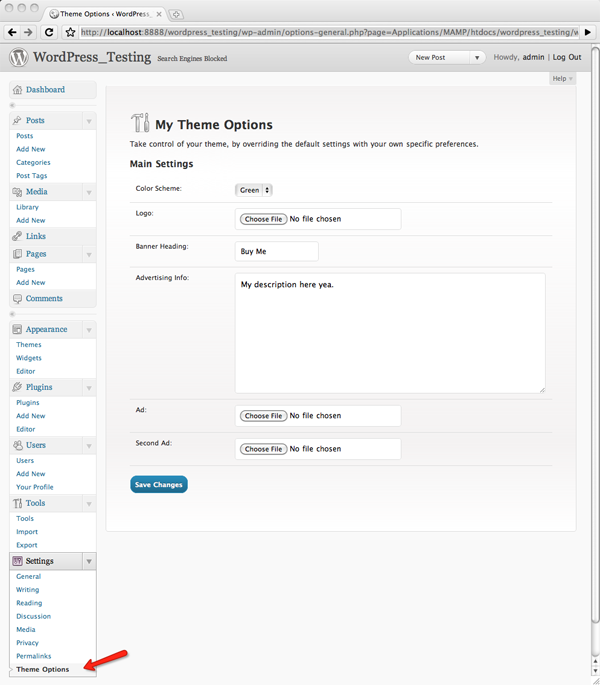 Figure 2, “The Theme Options link in the WordPress dashboard” shows the link output in the Settings section of the WordPress dashboard menu. The div with a class of icon32 is used to add that little icon. WordPress has a variety of icons that it uses for various pages; we’re just borrowing this one for our custom page. By default, WordPress dashboard buttons are grey. By applying a class of button-primary, for which WordPress has already written styling, we can make the button blue, and have it “pop” a bit more. We use esc_attr_e('Save Changes') as the value for the Submit button. We use the translation function to ensure that this text can be localized. Remember, when possible, to always use WordPress’s built-in classes. This makes your pages more consistent with the visuals of the dashboard. You must have noticed that—somewhat strangely, perhaps—we didn’t add any inputs to our form. If we were using the old method, we would have done so; however, with the Settings API, the process works a bit differently. We’ll be doing more with this function in the next example. This code requires a bit of explanation. In its simplest form, the function echos out a textbox. We’ve given this input the name plugin_options[banner_heading], to allow us to add a new key to the plugin_options setting that we registered previously. Lastly, these inputs won’t always be blank. To remind the administrator which values are currently set in each option, we use the value attribute of the textbox to display the current value of this particular option. settings_fields: This extremely helpful function will echo out all of the hidden fields for us, increasing the security of our plugin. Before the Settings API existed, we had to do this manually. This function accepts one parameter: the option_group name that was specified in the register_setting function. We called ours plugin_options. do_settings_sections: This function cycles through all of the fields that we’ve created (only one so far) and displays the inputs accordingly. It also accepts one parameter, which should be equal to the unique page ID for our Options page. If you return to the WordPress dashboard and click on the Theme Options page, you’ll see a form field for the banner heading, as shown in Figure 4, “Our new banner heading option”. The textbox from the image above is blank because we haven’t yet set a value for the banner_heading option. As soon as we enter a value, click Save Changes, and refresh the page, it’ll display the current value of the option within the database. Believe it or not, you now have a working Options page! It only has one option, but now, the process of adding more is amazingly simple. So let’s imagine that we applied a value of “My Awesome Banner Heading” to the plugin_options[banner_heading] field above. Your question might now be, “How do I retrieve this value in my theme?” Easy. This code will output an h2 element, as shown in Figure 5, “Displaying the banner heading”. admin_register_head is the callback function that will handle the creation of our stylesheet. Assuming that we’ve added a new options-page.css stylesheet to the functions folder, we can echo out a link tag that points to that file. The form will now appear as shown in Figure 6, “The display after we add the widefat class”. With this additional CSS, the form will appear as shown in Figure 7, “The Options form with our new custom CSS”. We can certainly take this much further, however, anything more would be beyond the scope of this tutorial. Here, we’ve just added a width, some padding, and a subtle background gradient for Mozilla and Webkit-based browsers. Now that we’ve successfully created a working Options form, we can flesh it out and add more fields. Let’s add a new section that allows the user of the theme to upload a logo. That should do it (almost)—it’ll add a new field to the page. Remember, the do_settings_sections function cycles through all of the settings fields and renders them on the page. As you can see in Figure 8, “The file upload field for the logo option”, a file upload field is now displayed. Okay, I lied! True, we’ve added the input to the page, but we haven’t written the logic that will handle the process of uploading and saving the image so that it can be accessed. This attribute determines how the form data will be encoded. This will be the most confusing section of our code. When a file is uploaded, it’s made available via the $_FILES superglobal variable. This array will contain information about the name, type, tmp_name, error, and size of the file. However, in this case, we can’t assume that only one file is being uploaded at a time. In fact, your Options page could include multiple file inputs. As such, we must use a foreach statement to filter through all of the items in the $_FILES array. Within the foreach statement, each uploaded image’s data will be represented via the $image array. We first determine if the image’s size is a size greater than 0, to ensure that the user did upload a file. Next, we perform a modest level of validation, to make sure that the user uploaded an image and not some other sort of file. Truthfully, in any other situation, this approach wouldn’t be adequate. A user could still change the extension of a file to, for instance, .png, and successfully upload their file. However, because this page is already limited to administrators only, this validation is meant more as a convenience for them. Should you require stronger protection for image uploads, use the getimagesize PHP function. This preg_match function determines if the regular expression jpg|jpeg|png|gif is included in the image type. If it is, we can assume that, most likely, the user did upload an image. Next, we call the wp_handle_upload WordPress function, which will take care of moving and saving the image to the uploads directory of your WordPress folder. $file will now be equal to an array of data containing the information about the upload—most notably, the URL of the location where it was saved (accessed with $file['url']). Lastly, we add a new key to our plugin_options option, and make it equal to a path to the image on the server. That’s the basic overview of uploading images. Truthfully, this script does more than I’ve described, but, as this tutorial is specifically about creating an Options page, I don’t want to stray too far from that specific topic. We can always discuss this function more within this article’s comments if you wish. If you’ve followed and worked along with this entire tutorial, give yourself a pat on the back. The most confusing part of the Settings API is memorizing all of its functions; however, once you do, you then have access to a great deal of power. For instance, we only created two options in this tutorial, but now, creating a new option will take you less than a minute! Jeffrey Way manages CodeCanyon, an online code marketplace, and Nettuts, a popular web development tutorial site. He also ran the biggest online marketplace for buying and selling WordPress themes--Theme Forest--for 2 years.